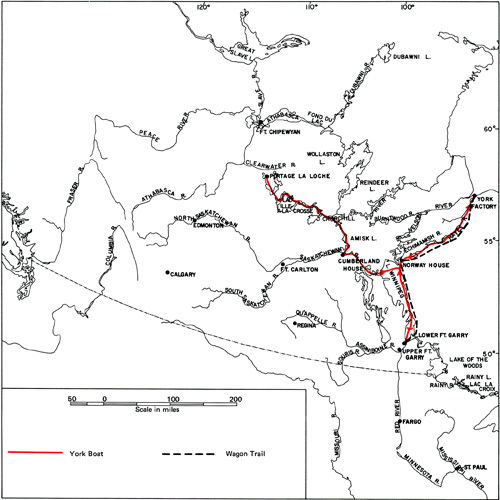 In the fall of 1830, men were cutting cellars out of the virgin prairie some 23 miles down-river from Fort Garry. This was the beginning of the construction of the Hudson's Bay Company's first stone fort in Rupert's Land since the building of the ill-fated Fort Prince of Wales, begun in 1732. This new fort was to replace Fort Garry which stood further south at the forks of the Red and Assiniboine rivers, and would bear the same name. The need for a new fort was imperative, for old Fort Garry had been severely damaged by the great flood of 1826 which had also carried off Fort Douglas. While the difficulties associated with the problems of transportation and safety from flood damage might provide an adequate explanation of the move from the forks, Simpson had a more personal reason for wanting a "solid comfortable Establishment" to be built; this was his intention to live at Red River. Schemes to raise cattle for tallow, to cultivate hemp and flax, and to raise sheep on a large scale, all intended to stabilize the colony's economy and reduce the danger of disaffection by the colonists, were projects requiring his presence in the settlement.3 It is also possible that he felt his residency would be good politics and that a gubernatorial establishment would heighten the prestige of the Hudson's Bay Company in the settlement. There is yet one more explanation for the building of Lower Fort Garry. Simpson did not intend to live alone at Red River, but with his eighteen-year-old cousin and bride, Frances. This could explain the building of the gracious Big House of the fort, more like a country manor than a trading post, and its secluded setting. Compare this retreat to the primitive mixed-blood society of the forks which a young Englishwoman might well have considered barbaric and where Simpson's own illegitimate offspring made their homes. As Frances wrote, she was "terrified to look about her in case of seeing something disagreeable. "4 What weight Simpson may have given to each of these various reasons when making his decision to build the Stone Fort is something we cannot know and of which he may have been himself unaware. Supernumeraries, always a great problem for the Hudson's Bay Company, provided the labour force which built the fort. Those employed in the earliest period were "of the McKenzie River Frêt Establishment, some of my [Simpson's] own crew, and a few of the young hands who came out by the ship...none of whom could have been so advantageously employed anywhere else. "7 Tradesmen were hired, as stipulated in the original Northern Council Minute governing the work. Of the many masons who may have been employed, we know the name of only one, André Gaudrie, who was hired by Leblanc and began work in May, 1831.8 He probably remained with the Company until the end of 1834.